Can Too Much Risk Avoidance Make You Lose Money? While you don’t want to be a reckless investor, over-zealous attempts at risk avoidance can cause you to lose money. Imagine that your friend invites you to play a game of chess. She is a good chess player, and there is a possibility that she will win. However, there is also a chance that you will win. But you decide that as you don’t want to take the risk of getting beaten, you won’t play at all. What do you gain from this decision to avoid risk altogether? Well, you definitely won’t lose the game. No one will beat you, and you won’t feel a sense of defeat. But you won’t win either. You certainly avoided a potentially uncomfortable position and replaced it with a neutral position – yet in doing so, you gave up the possibility of a pleasant position. How do you know for sure that you will lose? Wouldn’t it be better to at least try? 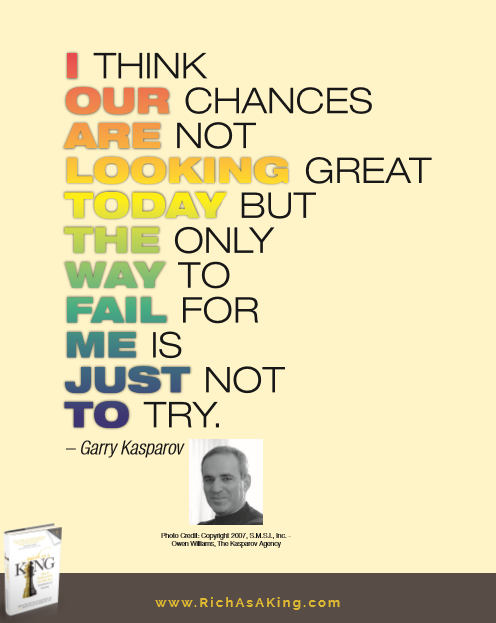 Famous chess grandmaster Garry Kasparov once said: “I think our chances are not looking great today, but the only way to fail for me is just not to try.” His quote does not apply only to the world of chess, but also relates to investing. There is no such thing as an investment that is completely risk free, and some people find this idea extremely frightening. Their fear of losing money, known as “loss aversion,” is great enough to cause them to make poor investment decisions or not to invest their funds at all. Rather than putting their money into something that could potentially earn a positive return, they keep their funds in the bank as opposed to the stock market. Their logic is that, at least, they won’t actually lose anything even if bank interest rates are low. What they don’t realize is that rising inflation rates can devalue the money that is sitting in the bank. The $100,000 that they initially deposited 20 years ago would buy tens of thousands of dollars fewer goods and services than it did when they first put their money in the “safe” bank deposit. Their fear of making a possible loss lead them to an actual failure since in real terms, their money lost value even though it was supposedly safe. Life is full of risks, and it’s worth taking the occasional risk in order to get ahead. At the same time, avoid being reckless. The best way to manage risks, whether in investing, chess, or in life in general, is to follow a path of taking a calculated risk. When making any decision, look at what you might win, what you may lose, and make an educated and thoughtful decision. This post was based on a quote from the Rich As A King Posterbook. For other inspiring chess quotes, download the poster book here.